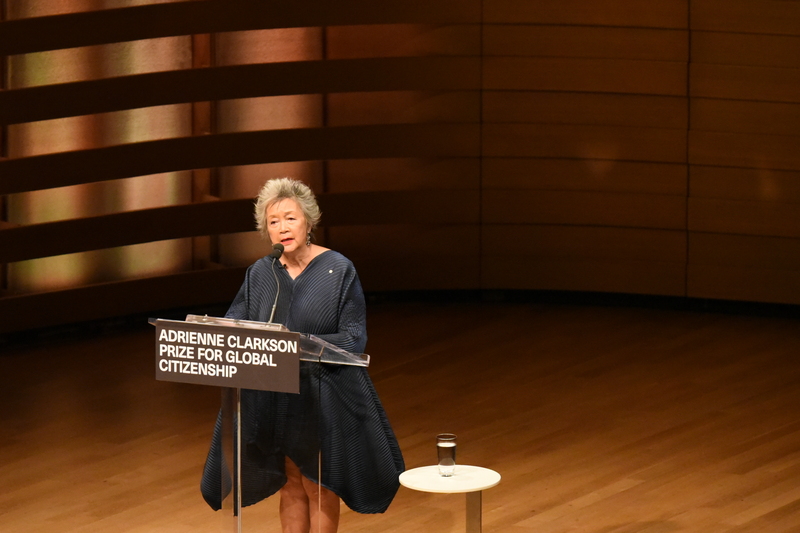 The Right Honourable Adrienne Clarkson pays tribute to the work of His Highness the Aga Khan before presenting him with the Prize for Global Citizenship which bears her name. Tonight, this prize for Global Citizenship is recognising and celebrating His Highness the Aga Khan, whose entire life demonstrates steadfast unchanging commitment to the ideals of belonging and inclusion. He is someone who has consistently encouraged thought and dialogue as well as practical approaches and inventing strategies that remove barriers, that help to change attitudes, and that ultimately reinforce principles of respect and understanding. I feel the significance of this prize deeply, because I arrived in this country at the age of two-and-a-half as a refugee of a war on a red cross ship, and all of my life in Canada has been made possible by the kind of principles that His Highness the Aga Khan embodies and makes us aware of everyday. His Highness has realised through his almost 60 years of leadership of the Ismaili people, that no true development can happen without the pre-condition of a healthy civil society. Only the strength of a society that can pay attention to rural populations, which are frequently geographically isolated, and to the misery of the urban poor, who are totally marginalised. It is his efforts to bring them to equality, to security, to opportunity and to humane treatment that we are honouring by recognising him as a global citizen. His Highness is totally committed to pluralism. And, his commitment has had a pervasive effect over the last decade, particularly in making the world understand pluralism, that pluralism is as important as human rights to ensure peace, democracy, and a better quality of life. His Highness has continually pointed out that the management of pluralism, its establishment as a pure value, is critical to a peaceful, harmonious understanding and he points out that pluralism does not happen by accident, but as the product of enlightened education, of moral and material investments by governments, and by the recognition of human beings that each and every human being shares a common humanity. And that no human being is more human than any other. His Highness has been the inspiring founder of universities and colleges – because education is one of the democratic pillars that he recognises. He alerts us to the fact that education is not simply the promotion of dogmatic commitments or ideological choices. He emphasises always that there must be scientific problem-solving with a continued openness to new questions. The way in which he has dealt with the fashionable “clash of civilisations” is to point out that it is really a “clash of ignorance”. He points out that this ignorance is both historic and current and he is unequivocal in his belief that this ignorance could have been avoided if there had been more dialogue and understanding between the Judeo-Christian and Muslim worlds. He always sees clearly where democracy has failed to create human and institutional resources to nurture young democracies. He is a wise and somewhat sad observer of the fact that corruption can grow out of the sometimes sheer incompetence of democratic failure His belief in what democracy can do is the most inspiring of all. Because he understands there is a need to be flexible, to be diverse in the institutions that take part in the democratic life. And, most important of all, that the public’s capacity and understanding of democracy can only come about through education and awareness. And finally, he sees and emphasises the need to strengthen public integrity as the important and sound foundation on which democracy can rest and remain stable. He asks us all to realise that it is not simply governments that make democracy work. He makes us realise that citizens of the most successful democracies are the ones in which their role is played because of their voluntary energies and their commitment to the public good. To commemorate this prize, I had a medal created by the sculpture Anna Williams. It shows the Inuit Goddess of the Sea, Sedna, emerging from the Arctic waves to pass a vulnerable world to the outstretched arms of a winged triumphal guardian. Because of his wisdom, practicality, and his total commitment to the betterment of the world through a realistic understanding of the way in which democracy can bring citizens to their fullest level of participation - It is my great pleasure to honour His Highness the Aga Khan with this first Global Citizenship Prize.